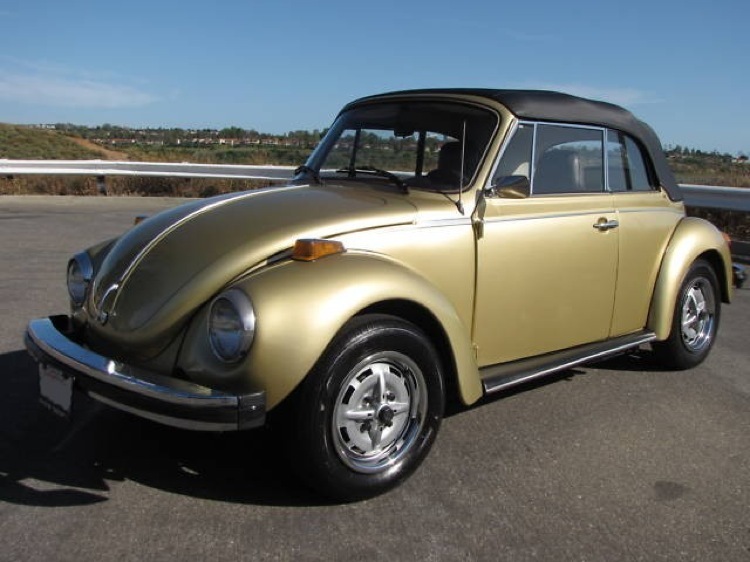 My first car, back in my college days, was a 1974 Volkswagon Bug. It had a funky black and gold paint job, a weird anti-theft system where it wouldn't start unless the fan button was pushed in, no radio, a balky clutch, no air conditioning and and a tendency to shake violently at speeds over 50 mph. I loved that car. It ran fine on the cheapest gas. I could push the side swivel windows to get a nice breeze on my face on a hot day. I never got a speeding ticket in that car. I would draft behind trucks on the freeway to minimize the shaking. The front space under the hood had plenty of storage. Parts were pretty inexpensive and some simple repairs and oil changes I learned how to do myself. My friends loved it because no one felt bad about getting beach sand in my car, a cooler would fit under the back seat, and they could hear/spot my vehicle coming from a considerable distance. 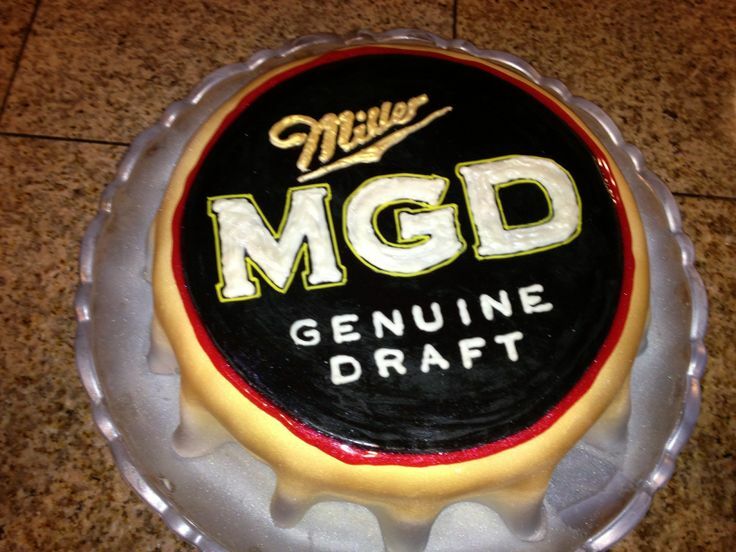 They dubbed it MGD. Mine looked like this, except with a black hood, and not quite as pristine. Anyway, not all my friends at this time were broke artists. One had just finished medical school and celebrated by purchasing a beautiful BMW. Determined to keep it looking/running perfectly, he opted out of beach and camping trips, bought only the most expensive gas and got it washed and detailed regularly. He trusted me to drive it and I got my first speeding ticket in that car, partly because it traveled so smoothly I didn't feel I was going fast at all. On the other hand, he couldn't drive my car without getting incredibly frustrated. He'd forget how to start it, couldn't get a good feel for the clutch and would stall often, would panic when the shaking started, and broke the swivel mechanism on the driver's window trying to adjust it. But this was all the car's fault, always. "How can you drive such a piece of crap?" was his constant question. I'd just shrug. My car worked for me, I knew how to work with it, it got me places and it was mine. "Let's go in Andrea's car," my buddy Rachel said when we were planning a road trip up the coast with friends. "If we go in the doctor's BMW, he won't let us eat in the car or pull off the road for anything interesting." Anyway, that's my analogy for the USMNT. Clearly, the team is more like my Bug, and my argument has never been that the players are so good that they deserve a better coach than Klinsmann. It's more that because the team isn't that good, they need a better (more versatile, more inspirational, more creative, more tactical) coach. Me and the MGD, back in the day. Klinsmann is like the BMW-driving doctor, wondering why he can't coach the USA like he did Germany, refusing to adjust his approach and blaming the players every time things don't work, even when he makes a huge mistake (LD, the broken window swivel). I used to be pretty generous with my car. If someone needed to borrow the MGD for any reason, my only condition was that they know how to drive a stick shift. But after I fixed the window swivel, I barred the doctor from driving my car ever again. I realized I had to look out for what was mine, and if he wasn't going to be careful with it, I had to draw that line. He acted like it was no great loss, of course. Who would want to drive that piece of crap USMNT? More leftover quotes on Gio/Galaxy. Players are getting better. We’ve had a long year. We’ve had a lot of injuries and absences for periods of time. For the most part, we’re over the hump and hopefully, we can get our team healthy and ready for the last nine season games and hopefully for the playoffs. We’ll see. Baggio should be back soon. Not at all. We have to step on the field and play well each and every game and try to win. All that other stuff is all garbage and hype. We don’t talk about championships yet. It’d be nice to have. The way the league is made up right now, with the regular season schedule, it’s hard, because too many teams play without their players for so many games. The Supporters’ Shield is an awkward goal to have, given that a number of teams play without their players for long periods of time. So it makes that difficult. --Robbie Rogers Achilles heel issue? Every player has injuries and deals with it differently. He’s playing 90 minutes now. They’re a good team. I haven’t watched them that closely, but Castillo continues to be dangerous player. Diaz is good. Perez has been outstanding goalscorer. Defensively, they’re pretty solid. They’re a good team. We’ve seen the weather before. We had weather the other day, so it’s not an excuse. Still weather. --Gio adjustment? There’s been no issues to date. Like any player, they’ll be some ups and downs along the way, but he’s doing very well. I mentioned on Twitter today that I could have made my entire "Galaxy teammates adjusting to Gio" piece all on Dan Gargan's quotes. To prove it, I'll just leave the ones I didn't use right here. We understand the elements (heat in Dallas). It’s not going to be a surprise. We got a good result on the road in Colorado. That’s what our focus is for the next nine, to sharpen up and tighten some things in our game. People hyping our team means zero. People’s opinions on a team that hasn’t really played together yet don’t really mean anything. We all know that every day is a new day, so if we don’t prepare and bring our best game to every game, we have just as much opportunity of getting beat as anybody else does. Unless we’re prepared to live up to those expectations on a daily basis, that praise being put on our team doesn’t mean much. That’s a definite.That’s something that the guys here have understood and adapted to. We understand that when we’re not prepared to play a game, we’re going to get beat because there’s a lot of good teams in this league. We’re adjusted to that and well aware of it. That only helps us, because that raises our level as well. We’re all here to win titles. Just because Gio comes in and says he wants to win a title, that’s no different than the other 29 guys sitting in that locker room, because they all want to win championships, too. If they were to come in and say, we don’t want to win a championship, that wouldn’t be aligned with what everyone else is thinking. For them to say that they want to come here and win a title, well, of course they do. That’s why they’re coming here and that’s why everyone else is here. I'm absolutely not satisfied. If that was the case, then what am I doing here? What are we all doing here? If we’re not trying to win? That’s the name of the game. That’s why we play. That’s it. This isn’t rec sports. We’re not out here just for fun. Winning is what we do and what gives us the most joy. We’re greedy. Bruce has put together a roster that’s capable of doing that. The Supporters’ Shield might be tough to attain at this point, but I don’t think it’s out of reach. Hopefully, if we continue to gel and put the right pieces together and find a good rhythm so that another championship is realistic as well. Our approach might be a little bit different this weekend. They’re a dangerous team. They play kind of a different style. They have a lot of guys who are able to exploit weaknesses in one on one, which tends to make for a more disjointed game. Our team is focused on maintaining a good 11. This is a good test. It’ll be a formidable opponent. They both have some very dynamic players. They have that playmaker that sits in the hole and tries to pick out players. That was a fun piece. Sadly, it was only too easy to convince Alan to do that and show off his abs. He’s a good solid veteran. He’s been doing it for a while. Jaime was very good at reactionary saves. 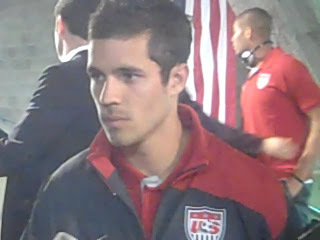 Donovan (Ricketts) is more of a presence in goal. For better or for worse, it could go either way, Gio’s a little bit more instinctual in front of the goal, in terms of creating stuff for himself. Landon was a very selfless player, both ways. If he needed to finish a goal, he’d finish a goal and he would also track back 90 yards to stop a play if he saw that developing. From what I’ve seen from Gio, he’s deadly in front of the net. That’s hopefully where we’ll be able to find him in those positions. 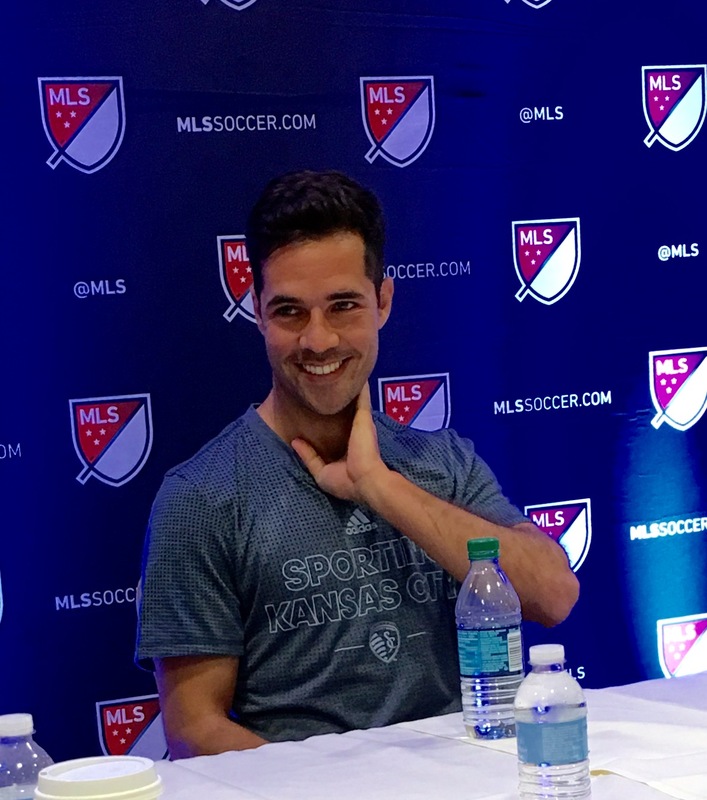 We looked to Landon to alleviate a little bit more pressure for us and kind of take over games. Gio will fit in well with our attacking corps and kind of create a bit more. That’s what I’ve seen so far. Both are obviously very talented and very deserving of wearing the #10 for LA. Wouldn’t see much difference there. Landon was a veteran at this point, and a veteran of the league as well. Gio’s coming in and he’s younger and he’s also new to the league. He probably doesn’t have the same amount of confidence from an understanding of the league. He’s learning and seeing a new culture and environment for himself. That’ll take time for him to get settled and to get comfortable. Keane’s a link. That’s not only a captain’s responsibility, it’s a friend’s responsibility. He has a relationship with both of them prior to the Galaxy. In order for both of them to feel comfortable, he’s been able to integrate them into the group. It’s not like the other guys on the team have been closed off. We have a pretty good locker room and it’s been very open and welcoming. Both of those guys, Gio and Gerrard, have fit in pretty well. I’ve been a witness to Stevie coming, and everyone was excited for him. Gio attracts a different fan base. He’s a bit younger. He also has the Mexican side, which is a big community in LA. The response to Gio being signed is a bit different, but the LA Galaxy community is excited to have both of them and rightfully so. 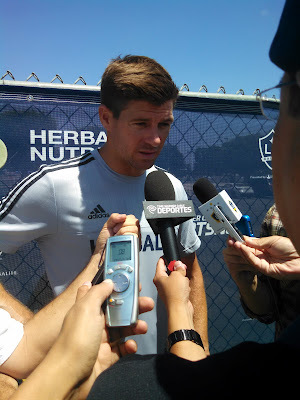 I wondered what Steven Gerrard thought about getting to the Galaxy fairly recently and getting asked so many questions about his new teammate, Gio Dos Santos. Turns out, he doesn't mind much at all. I was very pleased for him. He was desperate to get out there, onto the pitch. His debut went perfect. Good team performance and he came on and contributed at the end with a goal. I’m just pleased and smiling that the deals over the line and he’s an LA Galaxy player. I want to form a good relationship with him. I’m excited for him. I think he’ll adapt a lot quicker than me. He’s used to the climate. He knows the guys better than I do. I’m sure he’ll settle in very quickly and play in good performances with the team. I’m pleased for him. When I heard the news he was coming, I made contact with him. We were both very happy with the pickup. So Gerrard clearly doesn't mind answering Gio questions. At least, not nearly as much as he minds the extreme weather conditions in some places in MLS. Dan Gargan, his LA Galaxy defender teammate, had a bit of fun with him about dealing with that. Stevie’s first two road games were in Houston and Colorado. Dealing with that humidity and then that altitude - after the Colorado game, he was wondering where we were playing next. I told him we’re playing on Mars next. That’s indicative of some of the situations we have to deal with in this league, with the travel and the environments. Seeing that in two of your first three weeks was probably a bit eye-opening, because those are two of the tougher places to play. Dallas will be another one. Might was well see them all early and get them out of the way. Gio, obviously has played in heat plenty of times. That’s probably tougher on Stevie than it will be on Gio, but still, it’s a tough place to play. Some of that travel and flying three hours, and then playing a game the next day, it’s not easy either. It won’t be easy for either of them, because as far as I know, they’ve never had to deal with that before. Gerrard seemed to agree that he found the transition difficult. Houston was wild. That was certainly a big learning curve for me. We spoke about the challenges in the press conference and I said I’d give it my best and that’s what I’ve done. Yet, though Dallas won't be easy, Gerrard was optimistic about all the games ahead for the Galaxy, especially now with Gio on board. We can both help each other, on the pitch and off it as well. I said when I signed that all the players and the staff at LA Galaxy made me feel so welcome. I’m sure Gio’s feeling the same. The important thing is that all the players are available. When I signed, we had players in the Gold Cup, some injuries, and we were still trying to get Gio over the line. Now everyone’s fit and available, ready to fight for the team. I think we can go on a winning streak now and become a real force. For more on how Gio's LA teammates are adjusting to him joining the team - read this! Herculez Gomez will now play in Canada for Toronto FC, making him a true North American soccer player, now that he has plied his trade in clubs located in all of the countries that make up NAFTA. Having been in Canada recently, I can vouch that it's a cool spot. And Herc has always been a cool dude. Thus, it should be a good combination. Last night, Alan Gordon came off the field and was substituted by Giovani Dos Santos for the debut of the Mexican international as a Galaxy player. Gordon was already the answer to the trivia question,"Which player came off for David Beckham's debut as a Galaxy player? ", so perhaps this is all routine for him. Still, it was an interesting full circle moment. Gordon was pretty low-key about it, though. "I think it's a bigger deal to you guys than it is to me," he said, shrugging. I'll have more Dos Santos info later, but for now, here's a picture and my own full circle moment. My Beckham interview on NPR. Both these players were in the same country in 2005. One won. Years ago, I used to work the graveyard shift at my college radio station. I was on from midnight to 8am, then I hurried to my dorm room to change for a 9am class. Most of what went out on the air at that time was pre-programmed, although I did a short traffic and weather report at the top of every hour. Basically, that job helped me realize radio is both a great and tough medium. Even before I moved to the LA area, I used to listen to KPCC. When I got the call to come to my local NPR station as a soccer expert guest, I was excited. Have to say, I don't think my first time, discussing David Beckham, went all that well. It probably wasn't advisable to disagree with the host of the radio show that invited me right off the bat. My most recent appearance was to talk about Giovani Dos Santos, who honestly, has the potential to be as big a signing in certain ways as Beckham ever was. No, Dos Santos won't have the same world-wide impact, but on a local marketing level, this could be huge. He's much younger, a massive star with the Mexican fans in LA, and more creative on the ball. Dos Santos will still have to play well to justify all the hype, but the potential is definitely there. Here is the individual show segment about Dos Santos. Who knows - if Dos Santos plays amazingly tonight in his debut as a Galaxy player, I may be asked back again. It's always the big stories that get media attention. The Galaxy are also a more balanced team now to support the skills of Dos Santos. With Robbie Keane, Steven Gerrard, Gyasi Zardes and Omar Gonzalez all on board to help carry the burden of garnering wins, Dos Santos shouldn't feel as isolated as Landon Donovan and Beckham seemed to be those difficult years when the Galaxy depended on that duo so much.